From the Hancock County Courthouse, go east 2 blocks on Broad St. and turn right on Boland St. Travel 11 miles, bearing right (after about 8-1/2 miles) at the Linton - Beulah Highway split, to Hitchcock Cemetery Rd. Turn left and travel 1.8 miles. The cemetery is on the left. Alternately, follow the directions to Boland St. but travel 11.6 miles, bearing left at the Linton - Beulah Highway split - to Hitchcock Cemetery Rd. Turn right and travel 2.0 miles to the cemetery on your right. 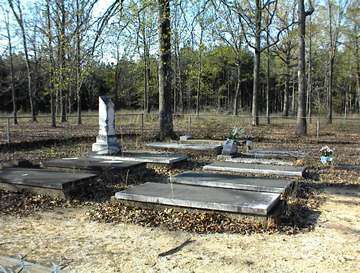 b. Lowden County, Va. "Kind father of love, thou art gone to thy rest, forever to bask amid the joys of the blest." Only child of T. W. and Mildred Greene. On the same gravestone as Louise G. Johnson. On the same gravestone as James T. Johnson.